The Korky Platinum Complete Toilet Repair Kit allows for a full overhaul of your toilet in one trip and is designed to fix no/slow refilling, running, and noisy toilets. The complete kit includes a fill valve, flush valve, flapper, and tank-to-bowl hardware. The Korky QuietFILL Platinum Toilet Fill Valve is quieter than other fill valves. It has a universal design to fit all brands and features a wide range of adjustability to fit most toilets. Also included is an Easy Adjust 2 inch flush valve that's fully adjustable, no hack-saw required. The flapper is made from exclusive longest lasting red rubber that resists chlorine, bacteria, city water treatment, hard water, and well water. Washing Machine Connector Kit includes 5ft washing machine Flex-Connect Stainless Steel braided supply with chrome plate elbows. Two sealing washers are supplied with the water inlet hoses to prevent water leaks. To be used with water in accessible locations only, in order to avoid stress on the connectors. Pro-Kit Installation Kit For The Toilet Contractor Kit Fits 3" Or 4" Waste Lines And Is For All Floor Type Closet Bowls. It Comes With A Wax Bowl Ring With Sleeve, Extending The Discharge Opening For A More Positive Seal And Assures Proper Bowl Alignment. It Also Comes With 3/8" X 12" Braided Stainless Steel Toilet Connector, And Closet Blots, Nuts And Washers. 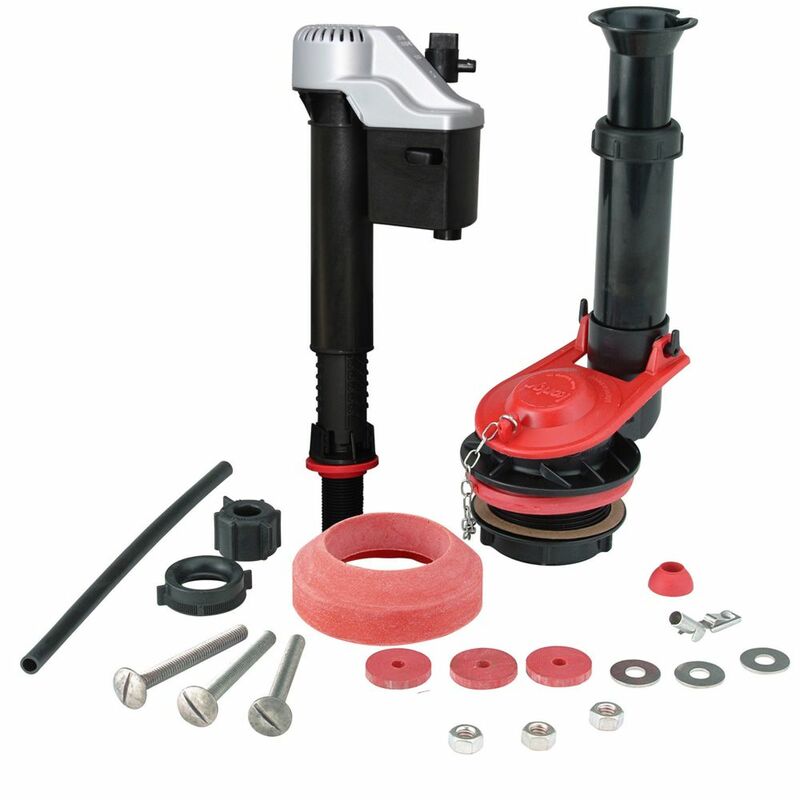 Platinum Complete Repair Kit The Korky Platinum Complete Toilet Repair Kit allows for a full overhaul of your toilet in one trip and is designed to fix no/slow refilling, running, and noisy toilets. The complete kit includes a fill valve, flush valve, flapper, and tank-to-bowl hardware. The Korky QuietFILL Platinum Toilet Fill Valve is quieter than other fill valves. It has a universal design to fit all brands and features a wide range of adjustability to fit most toilets. Also included is an Easy Adjust 2 inch flush valve that's fully adjustable, no hack-saw required. The flapper is made from exclusive longest lasting red rubber that resists chlorine, bacteria, city water treatment, hard water, and well water. Platinum Complete Repair Kit is rated 5.0 out of 5 by 3. Rated 5 out of 5 by Old Guy from As advertised, simple to install and works This replaced a 25 year old ball/inlet valve. There is an instruction video that I followed to do the install. If you take your time and follow the instructions just about anyone who can twist a nut and adjust the plastic tubes can do the removal and replacement . Excellent product . Your TOTO model ST854 requires a specialty replacement. Please contact TOTO by calling 1-888-295-8134 and they will assist you in finding the correct replacement part for your toilet.